You are going to flip for this flippin’ dolphin show. There’s no place to get up-close-and-personal with your favorite marine mammals (not fish!) than Gulf World in Panama City Beach FL. 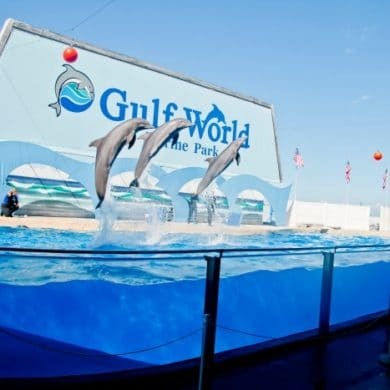 Founded in 1969, Gulf World was a mom-and-pop operation until 2015, when Cancun-based Dolphin Discovery purchased the park. Gulf World is now the only Dolphin Discovery in America. When you first walk into Gulf World, you’ll enter a lovely outdoor garden filled with alligators, birds, fish and turtle ponds and tortoise habitats. There’s plenty of shade here for the hot summer months. Right next to the garden is the shark and sea turtle channel. It’s really fun to watch a feeding, so be sure to set aside time for this informational show. The sea turtles are so big and love their lettuce, while the sharks fight over the food and cause a splash. 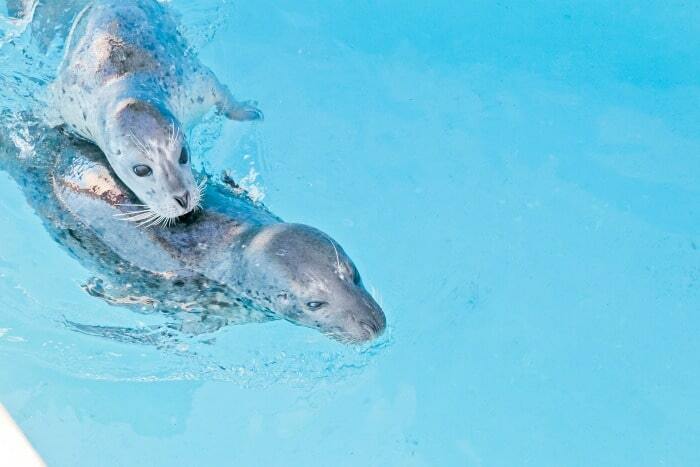 Next, make your way over to the seal habitat. These little guys are so cute we could hardly stand it. Soak up the cuteness, then take a look at the penguin habitat before you head over to Seal Lion Stadium. Sam, a marketing coordinator for Gulf World by Dolphin Discovery calls the 500 lb. sea lion “really just a big teddy bear.” It’s true! In a show featuring this big fellow and the rough-toothed dolphins – the only ones of their kind in the USA – stay until the end to witness a little kiss! The talented trainers call the dolphins their ‘athletes.’ When you head out of the show, you can watch the athletes play from just a few feet away. At the Meet & Greet, you can even shake a dolphin’s ‘hand’! Now might be a good time to grab a snack, as long as it’s not lettuce because the sea turtles clearly ate all of that. When you’ve rubbed feathers with all the exotic birds, buy some fish so you can feed the stingrays. Wash your hands before and after, and keep the fish hanging flat so the stingray knows the difference between his food and your finger! You could spend the whole day exploring all Gulf World has in store, but we recommend a Grand Finale at the bottle-nosed dolphin show at Dolphin Stadium. These massive creatures are so beautiful and obviously, adore their trainers. Behind the outdoor stadium are miles of trees and preservation land, so the view is fantastic even beyond the show. Insider tip: If you don’t want to get splashed, be sure to sit at least 10 rows back … those tails are strong! If that’s not close enough for you, there are three levels of dolphin encounters you can purchase and experience – from the Dolphin Encounter to the Swim Adventure all the way up to the Royal Swim, which includes dolphins pushing you out of the water by the soles of your feet. Gulf World Marine Institute is the nonprofit that rehabilitates dolphins and sea turtles. We asked how they find them, and it turns out most of these animals are discovered by someone else and called in. In fact, nine out of 23 dolphins here were rescued and deemed non-releasable for all sorts of reasons. Often their eco-hearing is off, so they would not be able to survive in the wild. 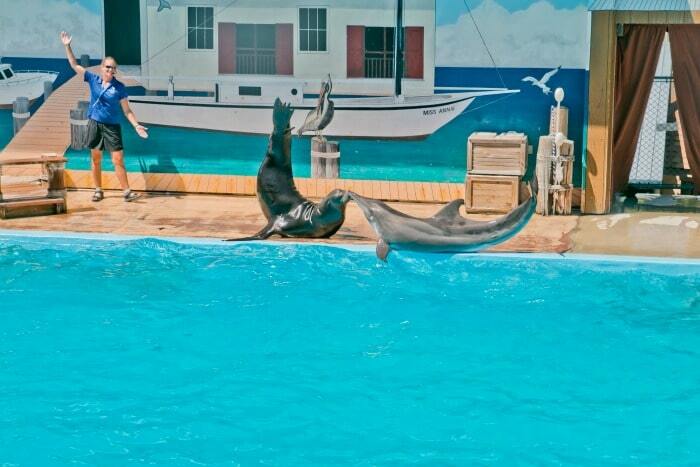 Lucky for them, Gulf World by Dolphin Discovery is their new happy home. We know you’ll have a happy day here. Gulf World Marine Park is located at 15412 Front Beach Road in Panama City Beach FL. 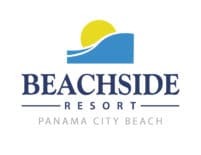 For more information, please visit the park website or call (850) 234-5271.